Whoa, Nelly! RIP Keith Jackson. It’s a shame he’ll miss these notes (and the game), because it’s going to be a good one. Anyhoo, I’ve been Valentine for 8-9 weeks. Now I’m Winthorpe. This game is a Reverse Zoolander. 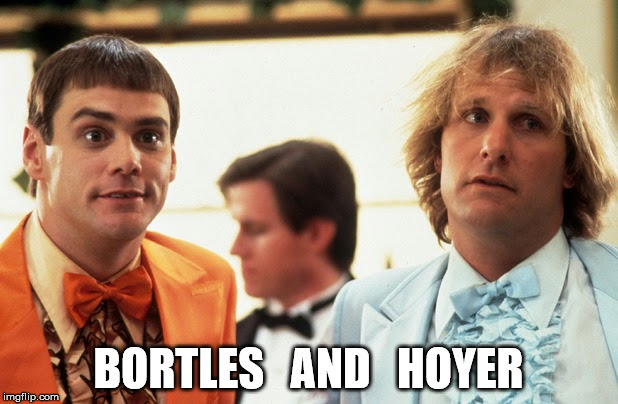 Bortles is and always will be Zoolander, and Brady is a perfect Hansel. Except this Sunday Bortles is the upstart who will ride in on his scooter and knock the reigning champion from his throne. Look at the picture and tell me that it’s not great. The only thing that would be better is if Brady can’t go, and it’s Hoyer vs Bortles for the trip to the Super Bowl. If that happens, replace all Zoolander references and images with Dumb and Dumber, and you’ll have it nailed. Finally, a note about the odds. The Pats are currently -150 to win the Super Bowl. I’ve been picking on this bet for weeks. OK, one week. Well, two weeks, if you count this week. Either way, it’s a bad line. Please don’t bet this. The Pats are -320 this week. In order to get -150 for them to win their next two games, the second game (i.e., Super Bowl) odds are -370. This means the Pats are something like an 8.5 point favorite over the Vikes or Eagles. I feel like I’m taking crazy pills looking at this.